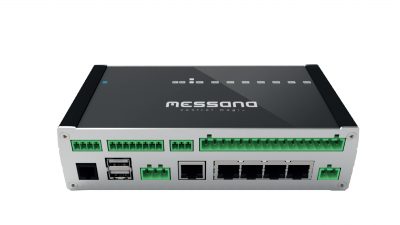 Messana Control Magic, a NEW radiant cooling control unit. Con trol Magic is the core of the hardware platform of any Messana radiant cooling and heating system. It constantly monitors every room of the building through accurate proprietary sensors (SenseMagic) and, based on the real thermal loads, dynamically modulates the supply water temperature (typically through a 2-10V electronic mixing valve). It regulates by itself up to 4 zones or can be expanded with the PoE Ethernet SwitchMagic modules to unlimited zoning. It controls all electromechanical components of a radiant space conditioning system (zone valves, mixing valves, circulators, buffer tanks, energy sources as well as DHW) and runs an advanced climate control algorithm with a sophisticated Optimized Energy & Comfort Performance (OECP) logic proprietary of Messana.